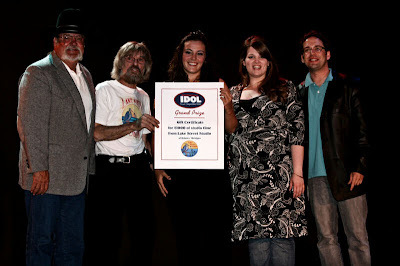 A Truly International Finish to International Idol: L-R: Judge "Gentleman" George Snider, Lake Street Studio proprietor Taylor Brugman, International Idol KT Antler, Judge Trisha Wells, and Emcee Jack Bradway. Photo courtesy of Tom Ewing. The final week of the marathon series International Idol at the Soo Theatre was a barn-burner. Each performer pulled out all the stops as they had a mere six minutes to impress judges and audience alike for one last time. Costume changes, personal dedications, flag waving, instrumental accompaniment, and even a bit of rule-bending was on the docket. Finally, after all of the challenges, surprises, twists, and turns had put the very best vocal performers in the Greater Sault Area to the test, one emerged to be crowned The International Idol. 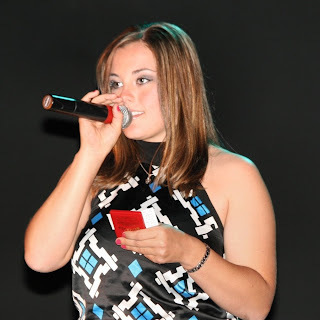 Besting the other eighteen contestants by showcasing her dynamic charisma, vocal quality, and guitar skill, KT Antler of Sault Ste Marie, Ontario, walked away the grand champion and recipient of a $1,000 gift certificate to record at Lake Street Studio courtesy of Taylor Brugman. At only thirteen years of age, Danielle Petingalo of Kincheloe, Michigan, came in a close second. Of course, all the contestants were winners. 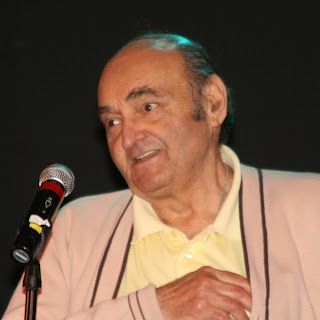 Throughout the competition they received assistance with song selection from Jennifer Compo of All Good Soundz, and expert judges "Gentleman" George Snider and Trisha Wells helped hone the contestants' talents. 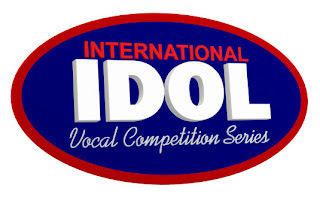 Who will win the next International Idol series? Do you have what it takes? July 27: International Idol Grand Finale! Week Three of the four-part marathon series, International Idol, rocked the Soo Theatre stage this past Sunday. Contestants were dared to go beyond their own personal expertise and work with one of their rivals in the Duet Challenge. The caliber of talent was never questioned; nevertheless, some duos showed more polish than others. Two by two, they wowed judges and audience alike. After six duets, the assembled crowd was duly impressed. Then, the final pairing of Week Two's winner, KT Antler and her handpicked partner, Michael Williams, took the competition to an entirely new level. Even in its own era, Grease never looked or sounded so good. Those assembled reacted the only way appropriate with the first standing ovation of the International Idol competition. Three weeks have elapsed. One to go. Nineteen contestants have graced the stage. Thirteen remain. Week Four's final performance is up to the competitors. After weeks of challenges and expert critiques by the judges, the competitors are now the ones who have to decide what they will do to prove that they are indeed the best performer in the Twin Saults. Who will win the grand prize of $1,000 recording time at Lake Street Studio? Will it be the rock band leader, opera singer, pre-sporting-event national anthem specialist, middle school student, or one of the other incredibly talented performers? To find out you need to be at Soo Theatre stage this Sunday, July 27th at 6:00 p.m. for the grand finale of International Idol. For more information on the contest, see the previous posting. Coming August 7-10: South Pacific at the Soo Theatre! Nellie Forbush and the nurses (from top to bottom): Lise White, Shirley Wilkinson, Martina Vollman, Melissa Kargiannakis, Elizabeth Jacobus, Julie Meier, and Robin Bergsma. Set during World War II, an Arkansas country girl, Nellie Forbush, played by Lise White, is a U.S. Navy nurse caring for U.S. Navy soldiers in the South Pacific. After a couple of weeks Nellie met local Frenchman Emile De Becque, played by Tom Lehman. Nellie and Emile immediately are drawn to each other and fall in love but, naturally, as any good romantic comedy goes, there are obstacles in their way. The U.S. Navy sailors with a combination of the U.S. Navy nurses add a lovely banter of comedy between the scenes that Nellie and Emile are apart. The comedic relief is enough to give the show its charisma, but the love between Nellie and Emile keep the audience wanting more. Some Enchanted Evening, I’m Gonna Wash that Man Right Outta My Hair, and Bali Hai are just a few favorite songs from this famous Broadway musical. At the 2008 Tony Awards South Pacific took 7 awards, including "Best Revival of a Musical" and "Best Direction of a Musical." U.S. Navy sailors (from left to right): Carl Meyer, Scott Gilbertson, Mark San Angelo, Nick Meier, and Michael Irvine. The 35-member cast of South Pacific is made of all local performers from around the Eastern Upper Peninsula and Sault Ste. Marie, Ontario. The show is also being run by local performers: director Dave Rhinard, music director Karen Hughes, choreographer Dianna George, and piano accompanist Maureen Delaney-Lehman. The directors are very pleased with the cast and feel optimistic that the audiences will fall in love with this production. 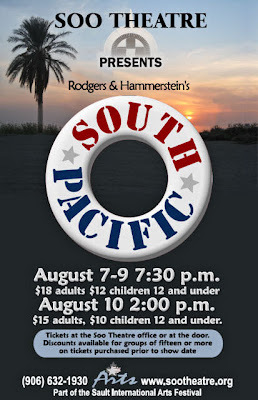 South Pacific is being performed at the Soo Theatre Project on Thursday, Friday, and Saturday, August 7, 8, and 9 at 7:30 p.m. Tickets are $18 for adults and $12 for children 12 and under. There will also be a matinée on Sunday, August 10 at 2 p.m., with tickets at $15 for adults and $10 for children 12 and under. Groups of 15 or more will be discounted $5 from each ticket. Please call in advance to give the box office enough time to accommodate your group. If you have any questions, please contact the Soo Theatre Project at (906) 632-1930. Thank you and hope to see you at the show! The Soo Theatre Project is seeking singers/actors for September 11,13, and 14, 2008 production of Die Fledermaus at the Soo Theatre in Sault Ste. Marie, Michigan. The Soo Theatre Project is casting the remaining roles in its September operetta, Die Fledermaus, or The Revenge of the Bat. This comic show, with music by Johann Strauss, combines musical numbers with dialogue scenes. We are seeking singers/dancers for the chorus in all voice parts. We are also casting some remaining lead and secondary roles. You do not have to sing to be in this production. There is one comedic speaking role, Frosch the jailor, in addition to Ivan the butler and various other acting parts. Please contact Karen Hughes at karenrebeccahughes@gmail.com for more information. Or you may call the theatre and leave a message at 906-632-1930. Please be sure to say you are calling about Fledermaus auditions. KT Antler wins International Idol's Week Two challenge at the Soo Theatre on July 13.
International Idol action at the Soo Theatre was humming – no – make that singing to the rafters on Sunday night. Two weeks into the four-week marathon competition, the contestants stepped up the challenge. Each contestant was given a genre of music to perform, often outside of their comfort zone. Some were tripped up by the challenge as blues, country, jazz, show-tune, rock, and even rap were thrown at the contestants. Others embraced their challenge with gusto. Highlights from the evening included Anna Wilson's well thought-out rendition of "Big Spender," Bill Kritselis's a capella serenade to judge Trisha Wells, and an impromptu duet by Marlee Fox and Brandon Carr. Once the scores had been tabulated, the winner of week two's challenge was KT Antler. Three others were thanked for their efforts, but eliminated from further competition. Bill Kritselis serenades Judge Trisha Wells in Week 2 of the International Idol Vocal Competition at the Soo Theatre on July 13. Dynamic Week Three action will begin on the Soo Theatre stage on Sunday, July 20 at 6:00 p.m. Twists, turns, surprises, and general unknowns await the remaining fifteen contestants as they battle for the grand prize of $1,000 worth of studio time at Lake Street Studio. Of course, the true winner is always the audience as they are treated to the very best performers and performances the Twin Saults have to offer. Enjoy The Best Little Theatre in Town on July 18! “A hardworking and enthusiastic group of kids, we are having so much fun! This two-week camp is really showcasing how much young talent we have in this area,” said directors Dottie Case and Dianna George. Case and George are directing the Soo Theatre Project and STARS Musical Theatre Day Camp production of The Best Little Theatre in Town. A talented and energetic cast of middle and high school students will perform. This engaging musical is a “play within a play” centered on a shady accountant, James P. Penny Packer. Packer announces that he’ll have to shut down the best little theatre in town, due to lack of funds. That’s when the theatre’s owner Mrs. Goodman, popular director Cecille Deville, and the tightly-knit cast go into action to keep “the best little theatre in town” running. Sit back and have fun while supporting STARS Musical Theatre Day Camp. 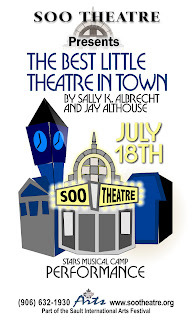 The Best Little Theatre in Town will be performed on the Soo Theatre Project stage at 534 Ashmun Street on Friday, July 18, at 7 p.m. Admission is $5 per person. Tickets are selling now and will also be sold at the door. For more information, please call (906) 632-1930. There's Still Time to Sign Up for International Idol! Last week's International Idol contestants wowed the judges. This week's competition will be on Sunday, July 13, at 6 p.m. at the Soo Theatre. From left, Executive Director/MC Jack Bradway, William Kritsellis, Jennifer Payment, Annis George, Corrine Koenemann, Lola Kennedy, Danielle Petingalo, M-E Polquin, Anna Wilson, and Brandon Carr. Seated are judges Mark San Angelo and "Gentleman George" Snider. 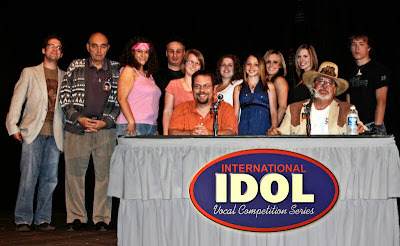 Sunday July 7, 2008 on the Soo Theatre Project's stage at 6 p.m. was the first of many International Idol vocal competitions being held every Sunday of July. Nine local talents took the stage, each unique in performance and style of music. The competitors ranged in ages from 13 to 80, with 2 male performers and 7 female performers. The celebrity judges were "Gentleman George" Snider and radio announcer Mark San Angelo. Both judges had constructive criticism for each performer's first time on the Soo Theatre Project stage. The judges were especially wowed by Danielle Petingalo, the youngest competitor. She not only had the stage presence of a performing veteran, she sang with a maturity that is hard to find in the oldest performers out there now. Each performance is accompanied by the karaoke styling of All Good Soundz. All Good Soundz has many songs to choose from and the latest technology out there. If they do not have what you want, send an e-mail to admin@allgoodsoundz.com and they will find what you are looking for. They can also answer any questions you may have. On Sunday July 13, 2008, you should expect many twist and turns. There will be prizes and surprises each Sunday, all leading up to the grand prize of $1,000 of studio time with the Lake Street Studio in Brimley, Michigan. Lake Street Studio is located on the waterfront of Brimley and is always accepting musicians looking to broaden their experience. If you love singing and performing, this is the competition for you! There is still time for new applicants to join the competition series this Sunday July 13, 2008. New applicants can pick up registration forms at the Soo Theatre Project between the hours of 10 a.m. and 6 p.m. Monday through Thursday and between 10 a.m. and 5 p.m. on Friday. 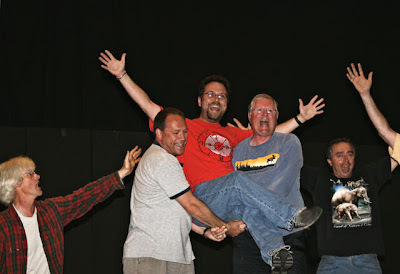 The Theatre asks for contestants to be ready and at the Theatre by 5:30 p.m. each Sunday. If you have any questions, please call the Soo Theatre office at (906) 632-1930. One Night Only! Rock Starz In Concert July 11! Soo Theatre Project presents Rock Starz, featuring B3NT Rollercoaster, Set to Random, The Darwin Project, and Scofflaw on Friday July 11, 2008 at 5 p.m. These four uniquely talented Northern Michigan bands will be performing as a benefit for the Soo Theatre Project. All representing a certain genre of rock, you won't want to miss this distinctive combination. B3NT Rollercoaster has exclusive stage energy that is not worth missing. Set to Random has a grounded earthly sound all their own. The Darwin Project has a hardworking, grassroots approach to performing live, and Scofflaw are full of an energy that is hard to forget. Tickets are $10 for adults, $8 for students and are available in advance or at the door at the Soo Theatre, 534 Ashmun St. in Sault Ste. Marie, Michigan. For more information, call the theatre at (906) 632-1930. Preview the bands on www.myspace.com under the music search engine and attend this one-time-only performance.